We are an Empire dedicated to military, economic, scientific, and architectural superiority! IMPORTANT: We strive for an extremely active org. 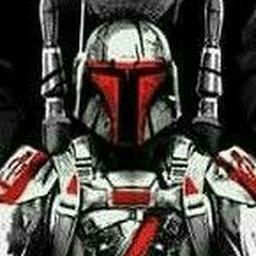 As such we will not be subject to the inflated numbers that come with accepting people into the org that do not have the game. If you don't have the game yet and you plan on getting it soon and want to join, you may join our discord with limited access to channels until you get the game. Once you get the game, you will be able to get accepted on here and join all citizen voice chats. AE is for players who want the security of an org with a professional military, the efficiency of well-run cities, the freedom to create their own businesses without heavy regulation, and the low taxes of minimal government. Until the game has 100% uptime and possibly after that, we will be hosting community game nights to strengthen the bond between players in our Org. 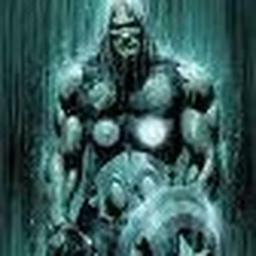 Did you join this game to mine? Did you join this game to trade? To become a leader of a great naval unit? Maybe even a ship designer/builder? Or maybe you have even more glorious dreams to realize. 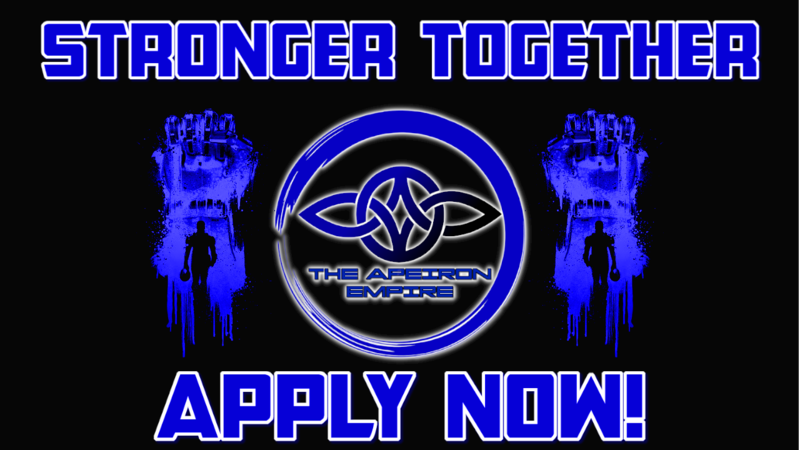 If you seek glory, power, riches, or above all, great relationships with real people who will aid you in battle, trade, and all other groups of the game, then join The Apeiron Empire! We will teach you the game and make sure you are put in the right environment to flourish and make a name for yourself. We pride ourselves on only allowing those who have the game to fully join the org fully. We are not like other orgs, what you see on our org page are real players that have the game. What are you waiting for? Your great future awaits you! Join now! 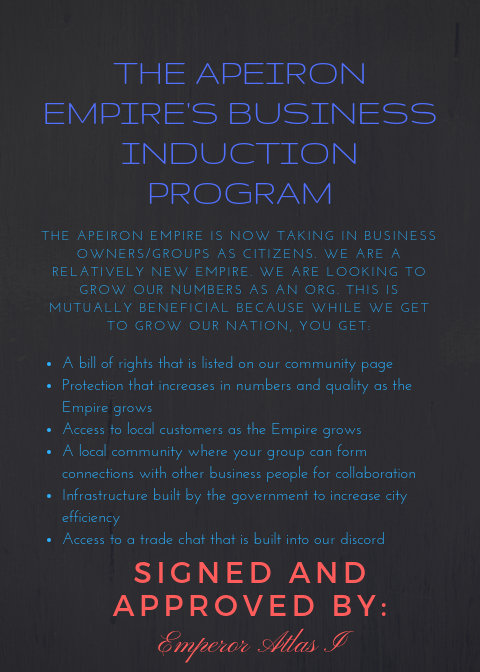 As Emperor of The Apeiron Empire, I would like to announce our Business Induction Program! If you wish to apply to the program join the discord and a high ranking official will speak to you about it. TAE is for players who want the security of an org with a professional military, the efficiency of well-run cities, the freedom to create their own businesses without heavy regulation, and the low taxes of minimal government. Citizens will receive court rulings in a reasonable amount of time. You are free to trade whatever goods you make or legally obtain. You have the freedom to legally own whatever you want as long as it was legally obtained. You have the right to defend yourself. From small guns to gigantic spaceships. While we will defend our citizens with whatever force necessary, we strongly believe they should be able to defend themselves, their fellow citizens, and their property. The state will assume that you are innocent until proven guilty. You may not violate or limit any of the rights of other citizens. You may not injure, attack, or harass any other citizens. You may not damage other citizens property. You may not conspire to commit crimes. You may not conspire against the government. You may not purposely sour relations between The Apeiron Empire and another organization. You may not run anti-Apeiron propaganda. You must pay dues or taxes every month.